Tonkotsu ramen is one of the most popular kinds of ramen, and the flavorful soup hails from Kagoshima, a prefecture (and city) in southern Japan on the island of Kyushu. The name tonkotsu comes from the kanji for “pig” and “bone,” and is a kind of soup made from pork belly, bones, spices, and other ingredients. I like tonkotsu ramen and sometimes buy a big bowl of the stuff from the local ramen shops, It is definitely not a healthy snack, and the tonkotsu broth can often be quite stinky and oily. If prepared with lower quality ingredients, it can give you a nasty stomach ache, which I have experienced. 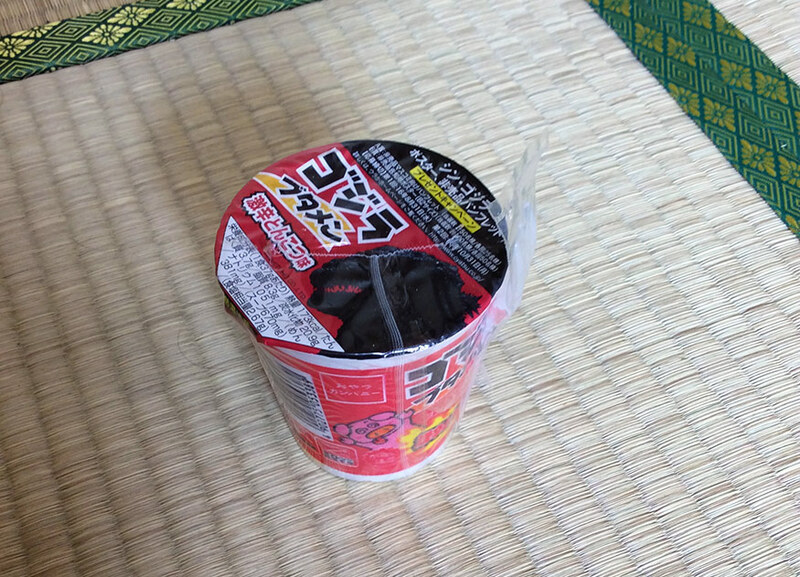 At any rate, the Godzilla Butamen (ゴジラ ブタメン) is not tonkotsu at it’s best simply because it is a kind of Cup Noodle type dish–a cheap snack to eat at home. The Butamen here is particularly small–much smaller than the standard Cup Noodle size–so it is not really satisfying as a meal on its own. Nevertheless, I liked it much better than the Shin Gojiramen chips, and I even liked it more than Cup Noodle (which I usually avoid, both because they are unhealthy and also because I just don’t enjoy them much). The Godzilla Butamen is a very simple snack. 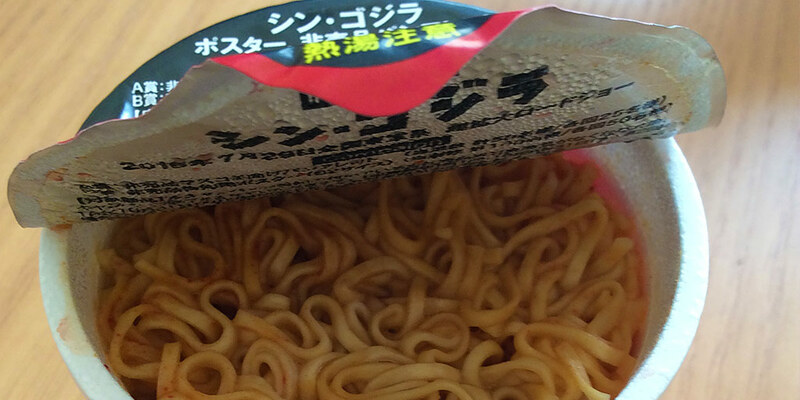 The cup includes nothing but the noodles with the spices already dumped in–there is no separate packet like with many instant noodle cups and bowls. You just pour in your boiling water, let sit for three minutes, and then eat with the little plastic fork that comes attached. I was skeptical of the effectiveness of said plastic fork, but it did its job quite well, and I was able to scoop out all but the smallest noodle bits with ease. The noodles themselves were flavorful enough to satisfy me for a product like this, and the spice I felt was not really extreme at all–I would call it more medium spice if that. It definitely has a kick if you drink the soup afterwards, but even that was not overwhelming to my tastes. My stomach was a little unhappy with me afterwards, however. My favorite part of the dish is the cup itself, which shows the Shin Godzilla design breathing fire and roasting a hapless cartoon pig. It appears that the pig is saying “Godzilla also breaths fire,” which I am guessing means our big mutated monster ate some Butamen and spit fire in response. There is even a “Warning! Spicy! sign on the cup. Like with the Shin Gojiramen, the Butamen also has a sort of promotional contest of sorts where customers can write in to the Oyatsu Company to try to get a special promotional poster or media packet, with instructions on how to do so written on the inside of the cover flap. Overall, I enjoyed this cup of Godzilla goodness, even though it is cheap and silly. Sure, this is no great snack, and its gimmicky and may give you a minor tummy upset, but I still liked it. 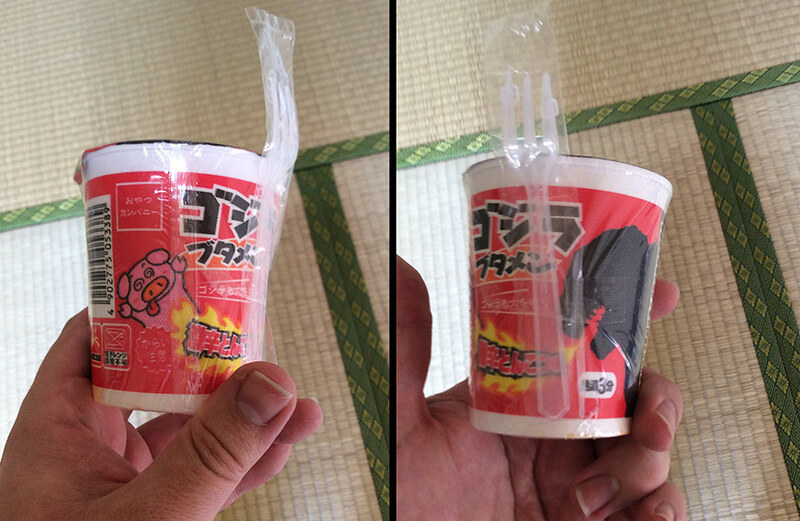 For some reason, though, I have only stumbled on these Butamen cups once, in one particular Seven Eleven near a movie theater. I visit Seven Elevens and other convenience stores very frequently, so I am surprised I have not seen more of them. Still, it’s just as well–I shouldn’t make a pig of myself!